When deciding on a new set of eyeglass frames, the options can be overwhelming. How do you decide which one to pick? What style will look good on your face and which pair matches your style? But, while choosing the perfect pair of glasses can be stressful, it doesn’t have to be. Your personal preference should be taken into consideration, but so should the shape of your face. Wondering what the best frames for your face are? Find out below. People with a round face shape usually have full cheeks and a rounded chin. The width and length of the face are fairly equal, as opposed to an oval face shape. To keep the face balanced, you don’t want to accentuate the roundness too much. That’s why square or rectangular frames tend to look great. The oval face is similar to a round face. However, the cheekbones are a little higher. The face is usually longer, too. But, overall, oval faces are the most balanced out of all the shapes. For that reason, you have more freedom when it comes to eyeglass frames. Oval faces look good in the majority of frame styles. But, look for a frame that is wider around the eyes to bring out the natural balance of your face. Square faces have more angular features. The jawline is sharp and the forehead is wide. Since the face is already square, you don’t want to choose square frames. Doing so might cause an unbalanced look. Instead, opt for a rounded pair with soft edges. If you have a heart-shaped, or triangular, face it means the top is wider than the bottom. People with this shape usually have pointed, narrow chins and high cheekbones. Because the top half is more prominent, look for frames that help balance out the bottom half like round or cat-eye frames. You’ll want to avoid top-heavy styles, like browline glasses. Aside from the overall shape of your face, other details matter, too. Your complexion is one of them. Eyeglasses come in all different colors and patterns, from brown tortoise to bright aqua. Make sure the pair you select doesn’t clash with your skin tone and hair color. You can also consider the size of your head. If you have a larger head or face, you want to avoid glasses that make it appear even larger. And, if you have a small head, you want to avoid glasses that make it appear even smaller. And finally, the frames should fit comfortably on your face. Overall, they should not be much wider than your face. The temples should sit right on your ears, and the bridge should rest comfortably on your nose. At the end of the day, you won’t know what glasses look good until you try them on. 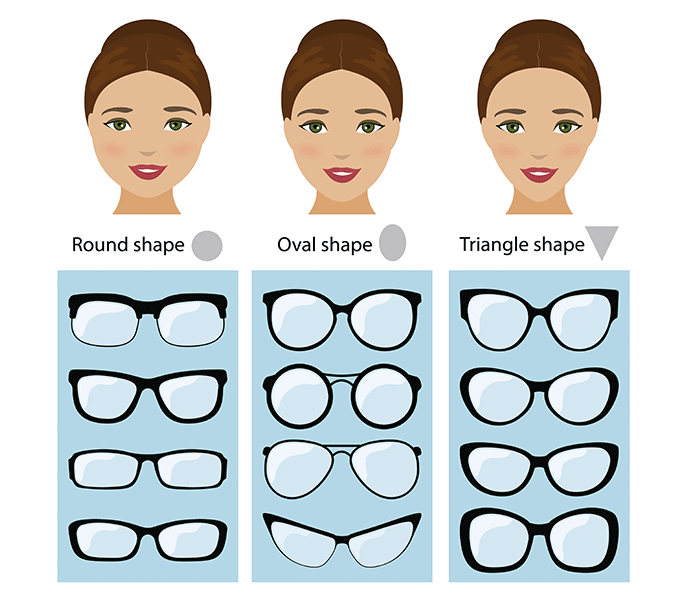 At Looking Glass Optical, we’ll help you find the right frames for your face shape. Schedule an appointment now to browse our selection of eyeglasses in person. Are Halloween Eye Contacts Safe for Your Eyes?